Dogs can be incredibly curious about anything new in their environment, and this includes your holiday tree. The challenge is to anticipate your dog’s need to investigate before he gets into trouble. Nothing can ruin the holidays quicker than a trip to the emergency vet. Follow these tips and help ensure your dog’s safety this holiday season. Make sure your tree has a steady base. Tipping can be a big problem, and your dog could be injured if the tree tips over on him. Once you have set it up, test your tree to see if it wiggles at all. If need be, you can anchor the base with some large rocks. Depending on where you set up the tree, you might also want to use some fishing line to tie the top of the tree to a banister or curtain rod to give it even more stability. If you have a real tree, the water in the stand harbors bacteria and other chemicals. When you anchor the base with rocks, arrange them to cover the basin as well and just leave enough room to add water. 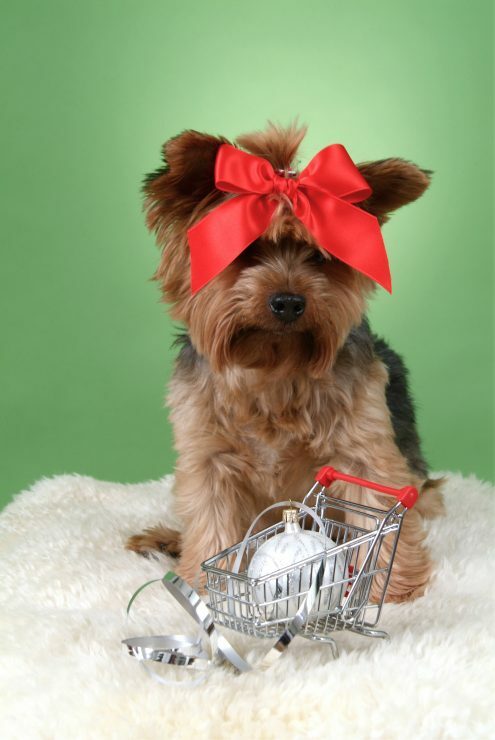 Place your tree skirt over the rocks, and this should keep your dog from drinking the water. Avoid hanging ornaments near the bottom of the tree where they are easily knocked off and broken. Your dog could cut his feet on the pieces or choke on an ornament if he tries to chew on it. Tinsel presents another hazard. It can cause an intestinal blockage if your dog eats it, so consider another type of garland that’s not so easy to pick off the tree. If you use an old-fashioned string of lights to light your tree, you’ll want to make sure your dog can’t chew the cord. Make sure the cord drapes off the back of the tree, and tape the excess cord to the floor using duct tape. You can easily cordon off the area around your tree using a portable exercise pen. Just run the panels around the tree to keep your dog away from it, and you can remove the pen when it’s time to hand out your gifts. This entry was posted on Saturday, December 1st, 2018 at 6:45 pm	and is filed under Articles, Front Page, News. You can follow any responses to this entry through the RSS 2.0 feed. Both comments and pings are currently closed.